. . .AND THE POLICEMAN." "For a year she had prayed that Geoffrey might be given back to her, and the Gods had heard her prayer. They had given her back Geoffrey, and with a careless generosity they had given her twice as much of him as she had expected." George Bevan's life get turned upside down when Maud Marsh jumps into a cab beside him, pursued by a thug that is in fact her brother Percy. Bevan goes to Belpher Castle to find her and win her heart, resulting in the usual Wodehouse tale of mistaken identity and elaborate schemes. Daffy mishaps abound as a golfing enthusiast (Wodehouse does love his golf!) and composer is set upon by a young woman in need and, true to form, the author has his characters dangling from the ends of mistaken identity wires. A wee bit less on laughs from what you would expect from PGW but nonetheless has a great plot. Was great fun. Rating: More like 4.5 stars. A Damsel in Distress (1919) by P.G. 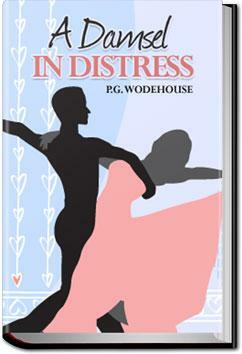 Wodehouse is yet another Wodehousian winner. This really is one of my all-time favorite books. I recently described to a friend as "Downton Abbey ... if Downton Abbey were a comedy." Lots of fun!